Quilting and Sewing with Kids: HUGE Sale on Craftsy Classes! Are you celebrating National Craft Month? If not, why not? 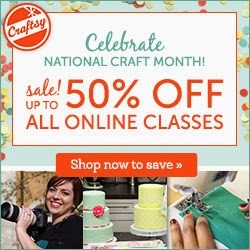 In honor of National Craft Month, Craftsy is having a HUGE sale with all online classes up to 50% off so you can learn a new skill or just do more of what you love. They also have a money-back guarantee, so what do you have to lose? And once you sign up for a class, it's forever yours. You can work at your own pace or watch the videos over and over - whatever you want. Since joining Craftsy, I've signed up for 17 classes and every one of them is great! But the sale ends Monday, March 16, 2015 so get on over there now! You can either click this affiliate link to go straight to Craftsy or you can just type Craftsy.com into your web browser.